One of my favorite ways to art journal is creating travel journals. I’ve made everything from complex scrapbooks, to simple one-page zines, to using my Traveler’s Notebook to document a week-long trip. Not only is it a good way to reflect on the day and what I’ve seen, but it’s a great way to look back and remember my trip. I have a pretty good idea of what works for me when I travel and what doesn’t. Here are a few tips to keep in mind when creating your own travel kit. I find that if I use a small journal, I am more likely to fill it up than if I use a larger journal. Moleskine Cahier books are great to use, as are Traveler’s Journals. When your journaling, try not to overdo it! You don’t need to spend hours sketching out the Notre Dame in your journal. Buy a postcard and stick it in with some washi tape instead or use some watercolor to create a simple, abstract drawing. I never use all my art supplies while I am traveling. I stick to three to five different supplies, depending on the length of the trip and the book I am using. While usually a city or region can be your theme, I like to go even deeper and use colors that match where I am going or using just one technique. For my trip to Italy, I used Tombow markers and local ephemera from the area. When I went to the U.S. a few years ago, I just used a couple markers and then added supplies that I bought when I was in New York City. I also always create a food page, where I write down everything I ate on the trip. You can include a page about doors or birds that you saw, include an itinerary, or just print photos of your favorite memories. Also let the place you are visiting inspire you! Each place has its own vibe and there is no reason to limit yourself before you get there. I love using business cards, maps, napkins, posters and pretty much anything I can glue down in my travel journals. For one, it helps me remember where I went, what restaurants I ate at and what I thought of them. It’s also great for collage and helps keep your packing light (at least on the way there!). 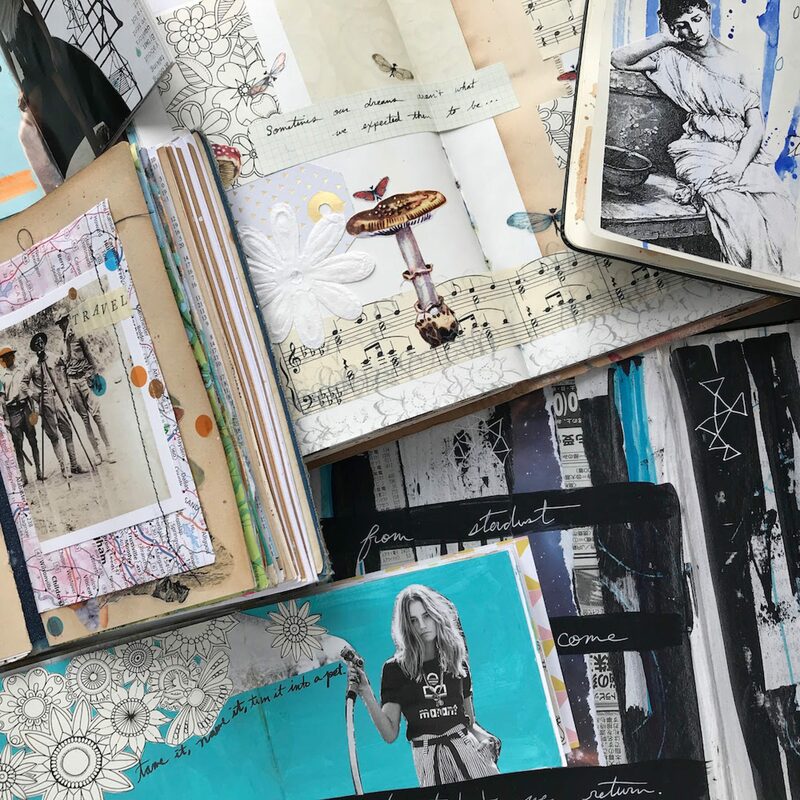 How many times have you brought art supplies with you, intending to make, then have so much fun you don’t create anything and the journal you intended to record memories in is still sitting on the shelf? I used to do that so many times, until I realized the only way I would make a travel journal is if I made it on the way. How do I do that? I find time. I create while traveling on the plane, or in a car. I spend 10 minutes before bed writing down what I saw and did. Because I keep it simple, using only a few supplies, I find it only takes a little bit of time each day to create a beautiful journal I will cherish for the rest of my life. Travel journals are my fave! I like your idea of including a themed page like food/doors/birds!